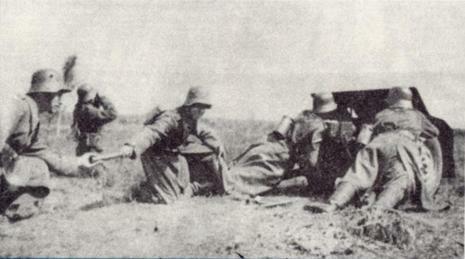 Contrary to most other Polish armies during the Polish Defensive War of 1939, the Kraków Army managed to withstand the initial German assault on Silesia and retreat steadily eastwards. 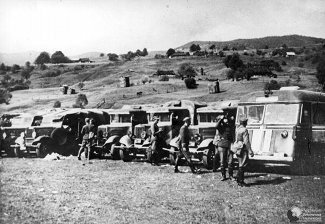 The Carpathians in the south and the Vistula river to the north provided enough cover for the army to focus on delaying actions in the path of the advancing Germans. However, the German numerical and technical superiority meant that the Polish forces were too weak to counter-attack and the best choice for the army was to hold the lines of rivers and major towns on the path of the Polish retreat. One such line was to be prepared along the San River by General Wacław Scaevolla-Wieczorkiewicz, the pre-war commanding officer of the Przemyśl-based 10th Corps Area, one of the peace-time units in the Polish Army. The preparations started on September 7. However, as most forces in the area were already mobilized and most march battalions were sent to the front, the defensive positions along the river banks were severely undermanned. The following day in the area between Przemyśl and Rozwadów, the Polish commander had only 10 battalions of infantry, one battalion of engineers and 42 pieces of artillery at his disposal. The central area of the line around Jarosław (between Radymno and Sieniawa was manned by four battalions of infantry and 20 guns under the command of Lieutenant-Colonel Jan Wójcik of the 2nd Legions' Infantry Division. The forces were insufficient to guard the river line, and especially so because the summer of 1939 was uncommonly dry and the level of water in Polish rivers was very low, allowing the armoured forces to cross them by fording. At the same time, the German 4th Light Division under Major-General Alfred Ritter von Hubicki and the 2nd Panzer Division under Lieutenant-General Rudolf Veiel were approaching the town of Jarosław from the north-west, aiming at crossing the river and cutting off the retreating Kraków Army from the east. 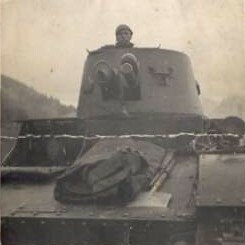 During the night of September 10, the earlier unit moved from the area of Rzeszów through Pruchnik and Zamiechów to Radymno at the San River. In the early morning the Germans took the Polish defenders by surprise and crossed the river, unopposed. 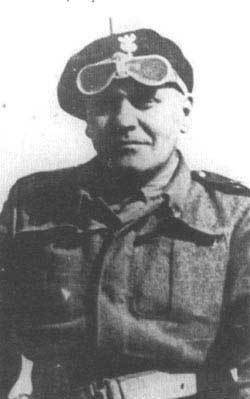 During the German invasion, Maczek led his unit in screening the retreat of Army Krakow. The brigade distinguished itself in numerous actions. Following the collapse of the “Rumanian Bridgehead” in the wake of the Soviet invasion, Maczek and many of his remaining men retreated across the Hungarian border and were interned.